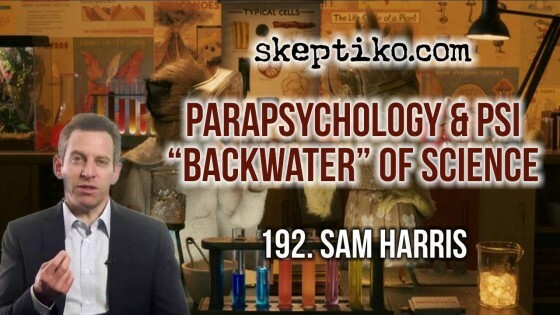 Emails from Sam Harris reveal what he really thinks about parapsychology and Psi research. Alex Tsakiris: …I like when little nuggets of truth, like this, are revealed. Because if we just listen to Sam Harris’ public stance on Psi, on parapsychology, on Dean Radin, and Rupert Sheldrake, it’s all very open, very collaborative, very, ‘you go boys, let’s see what you got.’ But when you read this you see what he really thinks about Psi research. It’s in the “backwater” of science. That’s where is really is for Sam Harris. …here he is equating near-death experience research to Psi research. Now, the only person who would do something like this is someone who knows very little about each. Even a rudimentary understand of the body of peer-reviewed NDE research should give Harris an appreciation for the larger neurological questions surrounding NDEs ( e.g. how can experiencers who have a wide variety of conditions, and even those who experience no medical trauma, have similar hyper-lucid transformative experiences?). Dr. Alexander’s account must be understood within the context of this work.